The other day we discussed the estimated electric range of the new PHEV Prius based on standardized test cycles and how real-world numbers are likely to fall well short of the official estimates. In the Prius, though, when the battery runs out of charge, the car can keep on going just like a regular Prius. Unfortunately, the range estimates we are seeing for some new EVs are likely to be equally wildly optimistic - and when the electrons run out, the driver is stranded. The crew at Consumer Reports recently got to spend a few days with one of the new production versions of the Mitsubishi iMiEV. 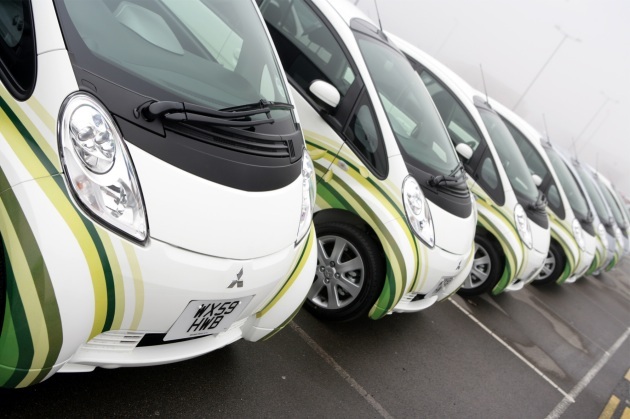 Mitsubishi claims the iMiEV can go about 100 miles on a charge, under optimal conditions. The range is estimated from the absurd Japanese 10-15 cycle (the same one that rates the Prius at 89 mpg!) Under those same optimal conditions, in the real world, the range of the iMiEV is probably going to be somewhere around 60 miles, tops. Mitsubishi acknowledges that turning on the heater (who would ever want to do that?) cuts the range in half. With the lights on (it gets dark early this time of year in northern parts of the country) and heat running, a CR editor driving the car home a whopping 12 miles just barely made it when starting with a half-full battery. We really like the idea of electric cars. However, as we've said on numerous occasions, automakers need to be totally honest about the real world range of their cars if they don't want to poison the market. Consumer Reports suffers range anxiety in a Mitsubishi iMiEV originally appeared on Autoblog Green on Wed, 16 Dec 2009 18:53:00 EST. Please see our terms for use of feeds. 0 comments on "Consumer Reports suffers range anxiety in a Mitsubishi iMiEV"